Upon arrival, your package will have all the attachments you could possibly want for a full body epilation session. This includes a trimmer cap, shaver head, sensitive area cap, facial cap, and efficiency cap. A cooling glove is also included, and this is a nice bonus. To use the device, simply refrigerate the blue gel that comes with the package and place it inside one pocket of the glove. Your hand will slip easily into the other pocket of the glove to allow you to soothe the skin after an epilation session. When used along with the pivoting massage epilator, the cooling glove eliminates discomfort. 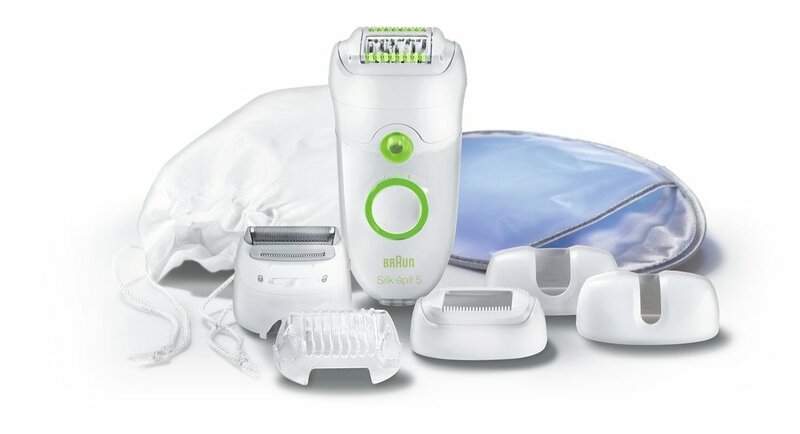 Courtesy of the close grip technology, the Braun Silk-épil 5 5780 epilator removes hairs as small as a grain of sand with remarkable effectiveness. This is aided by the angle of the 40 tweezers, which stay close to the skin and grip hair tightly for better removal. The pivoting head follows your body contours for better comfort and maximum thoroughness. Gripping the device during epilation is easy thanks to its curved ergonomic design. When shaving flat strands of hair, the SoftLift Tips will come quite in handy. They help to guide the tweezers during hair removal while lifting up flattened hair. In case you’re using the device in a room with poor lighting, you can also make use of the nifty light on the device called the SmartLight. It will illuminate the finest of hairs so that you don’t miss a single strand. There are two speed options to choose from when using this epilation unit. Speed control will be quite useful when you want to take epilation faster or slower. Another great aspect about the Braun Silk-épil 5 5780 epilator is that it’s really easy to maintain. The device is completely washable and features a sealed body, making it possible to clean under running water. All the heads are easy to attach, pull off, and clean individually. One feature that this epilator lacks is cordless operation. However, the Braun Silk-épil 5 5780 is still a good and dependable personal hygiene appliance. It has more features than your average epilator and does what it promises to do. In addition, the technology in this device puts more emphasis on minimizing pain, enhancing comfort, and over delivers on effective hair removal, thus making it the ideal choice for people who are new to epilating. The device’s asking price makes this unit worthy buying. Overall, buyers get a lot more for what they’re paying when you consider the features that come with well-designed epilator.